Google’s had a terrain view for its maps app since 2007, but it’s never been available on the iPhone, iPad, or iPod Touch until now. Ryan Petrich, a well-known iPhone homebrew developer recently released a Cydia tweak that unlocks the terrain view in the new Google maps app. The tweak: Topography for Google Maps unlocks a hidden map view in Google’s updated app. The topography view shows off the elevation and slope of the ground. If you’re interested in mountain climbing or other outdoors activities, a topographic map will give you a better idea of what the ground is really like than any flat map. The maps also focus on vegetation, though there isn’t a legend. We did a little digging, and we’ve found the closest thing to an official answer on the Google Maps Help Group. 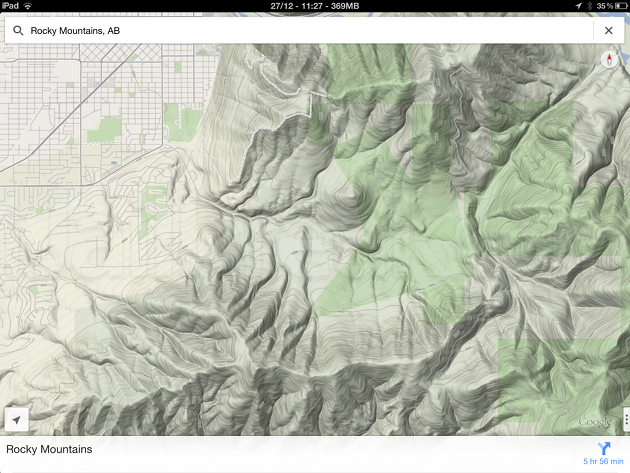 The topography maps layer button appears in the sidebar under Satellite. Caveat: The topography layer seems to be computer generated, not hand drawn. While this means that the map view works with the 3D tilt effect, it can look rougher and less clear than hand drawn topography maps, though this is largely a matter of taste. 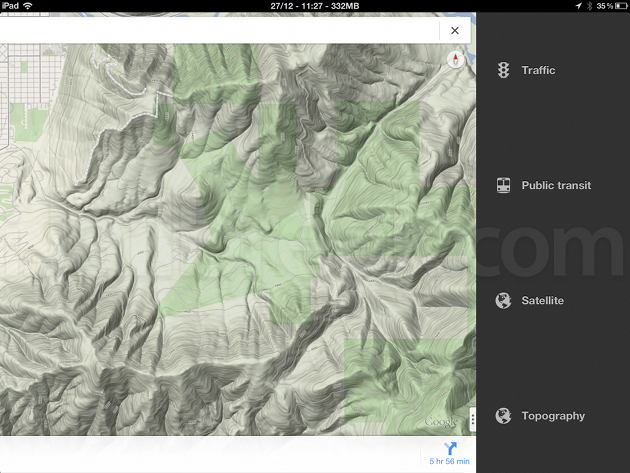 Where to find: Topography for Google Maps is available for free in Ryan Petrich’s repository. You can add it to Cydia by navigating to Manage -> Sources -> Edit -> Add by entering http://rpetri.ch/repo/ in the address bar. Synergy: Want to take your iPad hiking? Pair Topography for Google Maps with FullForce, and view the hidden maps layer on the big screen.